At the invitation of SGM Conrad Fernandez I had the opportunity to attend (as an observer) the first pilot running of the instructor course for the Special Operations Combatives Program (SOCP), conducted 15 – 26 March. This is an excellent program of instruction which teaches a unique mission-specific mix of combative techniques which are essential skills for Army special operations personnel fighting the Global War on Terror. Given the constantly evolving requirements these operators face in their various missions, most especially those conducted against high value targets, there is an urgent need for the type of training SOCP offers. Listed below are briefing points which further highlight the importance of this program. They are a result of what I observed during the training as well as discussions I had with SGM Fernandez and the SOCP instructors, Mr. Greg Thompson and SFC Carl Haskins. 1. The program is based on mission-specific skills: It has been said that, “if you don’t know where you are going, any path will get you there.” This certainly applies to training and is especially true of combatives instruction. Fortunately this does not apply to SOCP. For the last 12 years the program originator, Mr. Greg Thompson, has studied after- action reports from special operations and personally debriefed the operators to learn exactly what they faced and what type of combatives training they needed to enhance their operational capabilities. The current program of instruction for SOCP is the result of this painstaking trial-and-error process. One of the most successful combatives programs in military history,that developed for the OSS by Col. Rex Applegate, used exactly the same approach. In his book, The Close Combat Files of Colonel Rex Applegate, he tells us, “I sent not only trainees into combat, but instructors who would go out on special assignments and then come back and tell us if our techniques worked. If a technique didn’t work, we threw it out.” The Colonel would be pleased at how SOCP does business. 2. It uses highly qualified instructors: Even with the best available program of instruction, the training will only be as good as the instructors. 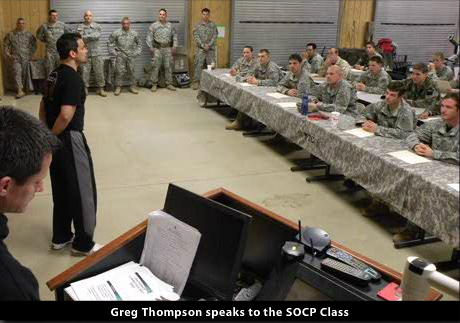 Mr. Thompson and SFC Haskins bring all of the necessary requirements as instructors to SOCP. They have exactly the right blend of a serious understanding of the mechanics of fighting techniques from a variety of disciplines combined with their incident analysis information as well as practical experience from missions downrange. 3. It is taught in a first-rate facility: Likewise the training process is greatly enhanced by being able to teach the subject in the proper environment. It will be obvious to anyone involved in this sort of high intensity physical training that the instructors have put a tremendous effort into developing students with a high level of proficiency while minimizing the chances that they will be injured during the process. A soldier attending the class who must withdraw due to training injuries is a loss we can ill afford given today’s operational tempo. Through the creative use of specially designed drills, martial arts training aids and protective equipment the student is able to undergo the training and focus totally on developing his or her skills without concerns about the possibility of serious injury. 4. The unique requirements of special operations necessitates an above-average skill level in combatives for the operator: Special operations by nature carry the highest risk of any mission we ask our soldiers to do. Since the operator is predictably going to be in extreme danger in a variety of operational environments, he must receive training, like SOCP, which recognizes this fact. In addition to the mission-specific environment, where he will operate as a member of a team, the operator may be called on to undertake a mission which will not permit him to carry a firearm. As a lone operator he may be forced to rely on empty hand and possibly knife skills if the situation requires. He also runs the risk of capture so there is a requirement for unarmed combative skills in the SERE/POW environment. SOCP provides a level of instruction which addresses all of these requirements. 5. All SOCP core skills as presently taught are integrated: The two biggest advances in combatives training in recent years have been the recognition of the importance of force-on-force scenario based training and the need to teach the full spectrum of use-of-force as an integrated skill, rather than a series of different skills. The importance of this integrated training process cannot be over-emphasized because it directly affects the level of proficiency an operator brings to the fight. Integrated training teaches the soldier to react more quickly, to choose the appropriate tool, to be able to upgrade or downgrade the level of force and tools he needs while engaged, all of which combines to reduce the chance of a mental stall in an engagement. 6. If the ROE require that a Continuum of Force be included in the training for the individual soldier some form of combatives must be taught to meet the non-lethal or less-than-lethal force requirement: SOCP recognizes this fact and includes a force continuum model in the student handbook. In addition it teaches appropriate techniques consistent with the differing use-of-force levels. If all you have in your skills toolbox is the ability to talk to your enemy or shoot him, you need SOCP! 7. If the soldier is required to handcuff, search and transport prisoners on the battlefield he needs training in how to perform these skills and combatives which are specific to prisoner handling: Here we can take a lesson from the law enforcement community. This is potentially one of the areas in which little or no training can lead to instances of inappropriate or excessive force. And we need to understand that the skill subsets that comprise the training for prisoner handling, i.e., handcuffing, searching and transporting, require special training because, unlike most combative techniques, they require the student to understand and be apply to apply the element of control. This is one of the toughest requirements in any combatives program because it involves so many variables such as size, weight, pain tolerance, mental and physical states complicated by the effects of drugs and alcohol and so forth. And prisoner handling becomes a critical skill when dealing with high value targets who may possess vital intelligence. SOCP includes a detailed block of instruction on prisoner handling during special operations in its POI. 8. SOCP training is continually being documented and validated by feedback from the field: SOCP is currently developing an incident database which will be an invaluable tool for helping it continually evolve as a “living” program with its finger on the pulse of operational needs. This database will also document what works and why as well as what doesn’t work and why. This is a tremendous asset in new instructor development because it can shorten the learning curve. Such a database also becomes the institutional memory which is often helpful in showing how and why a POI has developed and changed as requirements dictated. And finally such a program can be helpful in spotting patterns or trends which may not have been previously identified. 9. 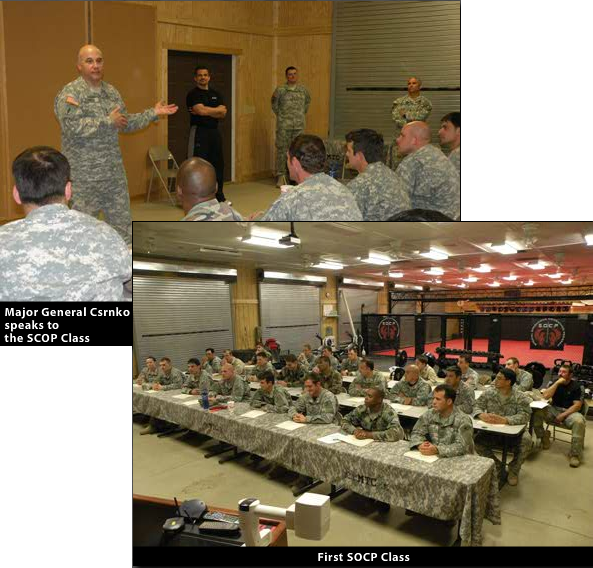 SOCP provides the capability for course design and instructor development in areas where there is currently no doctrine or training: When training requirements are identified there must be a go-to guy, a resident expert, an in house SME that can pull together, sometimes on short notice, a critical skills training program. In the case of combatives training for special operations personnel, SOCP performs this function. This is often easier to make a case for in wartime as opposed to peacetime but the requirement will always exist. In fact, they now have the capability with all of the resources described above, to take the lead in program development and course design regarding the full scope of combatives requirements for the Army special operations community. With the increasing number of SOCP instructors, as provided by this program, plus the information sharing capability they will have, necessary changes to the program can be quickly made and taught to the operators. 10. And finally SOCP complements MACP by providing the next level of training: In discussions with SGM Fernandez, Mr. Thompson and SFC Haskins, they made it very clear to me that they considered MACP the necessary entry level of training to the overall Army combatives program. 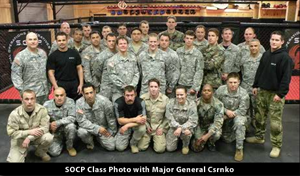 They felt that the MACP students who came to SOCP, caught on quicker and performed better than those who came to SOCP with no combatives background. Just as with Ranger or SF training, SOCP is designed to take the special operations soldier to the next level in combatives that are continually being developed for his or her specific needs. The SOCP instructor course will be a valuable force multiplier in this effort.